New and existing corporations can order share certificates and/or corporate kits from The Registry. A Liberian corporation that wishes to obtain share certificates may order share certificates from The LISCR Trust Company. 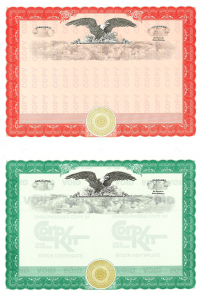 Share certificates are available in green or red. Please specify your preferred color in your order. Upon receipt of your order and payment, the share certificates will be printed and couriered to you to the address provided with your order. The share certificates are not valid until dated and signed by the two officers of the Corporation. The information provided for printing of share certificates will not be recorded or remain in the records of the Registered Agent; therefore, the Registered Agent will not be able to confirm the shareholding of the corporation, unless voluntarily filed with the Liberian Registry, or recorded with the Registered Agent. Instructions to file the names of shareholders will be provided upon request. Please email corporate@liscr.com if you would like to take advantage of this service. A Liberian corporation that wishes to obtain a corporate kit may order one through The LISCR Trust Company. Upon receipt of your order and payment, the corporate kit will be issued and couriered directly from the printing company to you to the address provided with your order.